AUTOMATED ASSEMBLIES CORPORATION® (AAC) is the first US company to design and manufacture robots to remove injection molded parts, and is leading the industry with some of the fastest top-entry industrial robots available today. In response to a growing need for faster, smarter, and easier to use robots, AAC embarked on a new injection molding robot design previously unseen in the marketplace. AAC implemented an innovative and extremely aggressive marketing specification to not only build the next generation Raptor® robots from the ground up, but to also create a "Common Controls Platform" for future robot and workcell developments. The proposed schedule was to have a shippable product within one year from project inception. 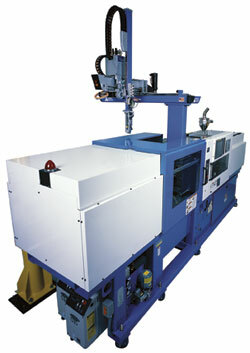 To help them with this aggressive schedule and next generation design, AAC contacted value-added reseller Target Electronic Supply, Inc. Based on the AAC marketing plan, Target saw a perfect fit for Danaher Motion motion control platforms and SynqNet® all-digital performance motion network technology to satisfy AAC's Raptor specifications, as well as their critical Common Platform Development Initiative.